In my daughter’s school, they have an interesting concept called the ‘Curiosity Club’. Every Thursday, a few kids choose to present a topic in front of the entire grade. The topics are varied from why magnets attract to how clouds are formed, what is photosynthesis, and what causes day and night. It’s a great way of explaining things to kids. No teacher is involved (except prompting a child, of course, from time to time). It’s a peer-to-peer exchange of information in a language the kids understand. 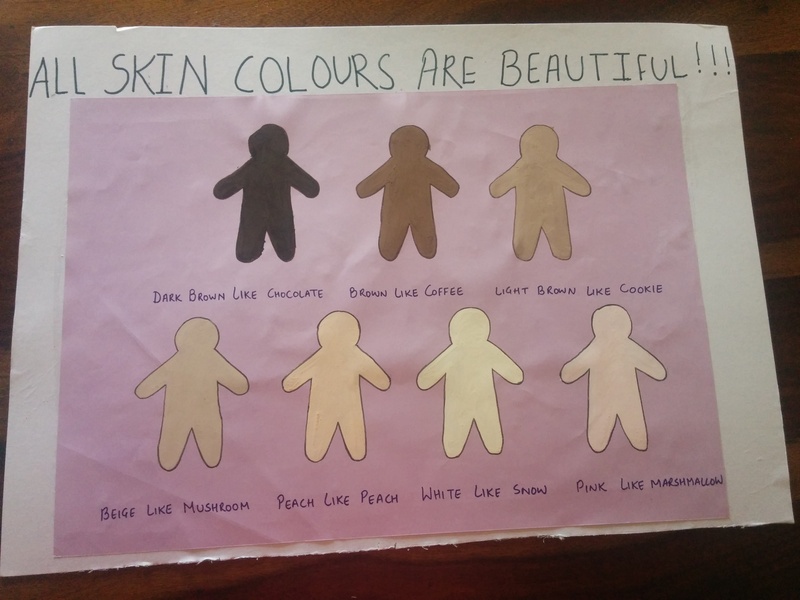 A few months ago, my daughter was obsessed with skin complexions. There was a time when she refused to play with a friend because she was brown. It took a collective effort from my husband and I to explain to her that there was nothing wrong in having brown skin. Even my daughter had dark wheatish complexion, that was not very different from her friend’s. She finally understood. Another instance was when she called an albino staying in our apartment complex as the ‘white man’. Again, it was an embarrassing episode. 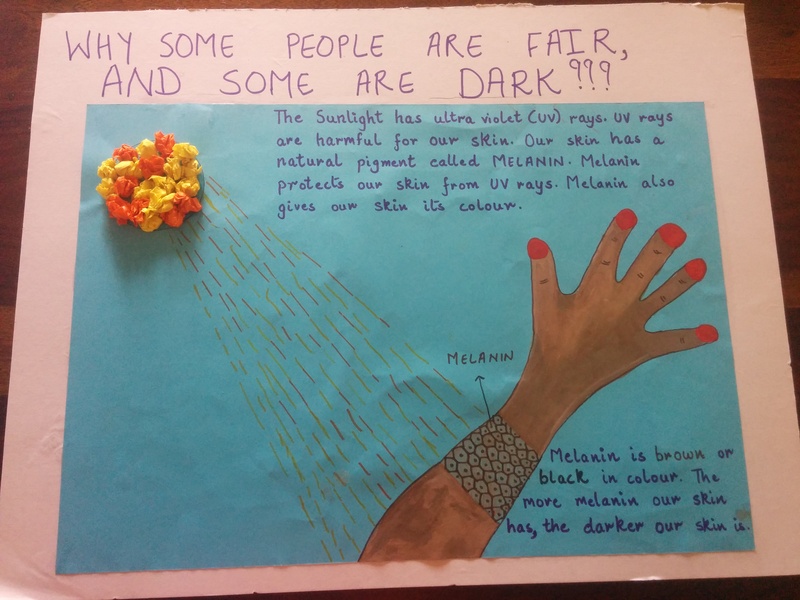 We never talked about skin colours at home, hence it’s difficult for me to understand why she did. But, it was something that needed to be addressed, and we did it alright. However, it made me wonder if other kids of her age (they are 5 years old) were obsessing about the same thing too. And, that’s when I convinced my daughter that she talk about why some people have fair complexion, while some have dark. I wrote to the teacher, and the teacher approved the topic and gave us a date. The Diwali holidays were upon us, and a perfect time to work on this assignment. It kept her busy too. And, in two days’ time, we finished these two charts. It was an art and craft class for her where she was sticking papers with glue, drawing and painting. The comparisons are all hers. And, something every child can easily relate to! Not only she enjoyed the project time, but learnt an important lesson as well. No sooner the charts were prepared than she started explaining them to her friends in the neighbourhood. I could see she thoroughly enjoyed. On the day of her Curiosity Club, she presented the subject to her schoolmates too. I am happy that a few kids like her who wondered about different skin complexions would get an answer, and would stop making a big thing out of it. They are our future, they have better things to do than worry about who is brown, who is yellow and who is pink. India’s obsession with fair skin is widely known. They use cosmetics and go for expensive treatments just to get a lighter skin tone. To what avail? What’s wrong with the colour you have? After all, all colours are beautiful!! !